The school offers many extra-curricular activities including a wide variety of sporting teams. While in the School Zone please obey all traffic and safety rules. Watch for pedestrian crossings and school bus stops. St. Louis Community School also offers a branch of the Wapiti Regional Library, available for all the community to use. 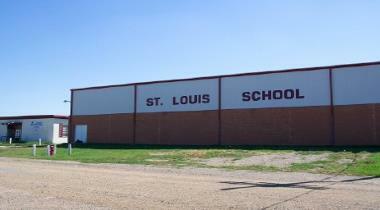 The St. Louis Community School has been serving the Village of St. Louis at its present location since the early 1950’s. It serves the Village of St. Louis as well as students from the surrounding area including Domremy, Hoey, Bellevue and One Arrow. Classes are offered for all grades from Kindergarten to Grade 12, with a pre-school program also available. Congratulations to the Graduating Class of 2008. Good luck with all your future plans. Welcome back to class, all teachers, staff and students for the 2008- 09 school year.